Peter, an ambassador from Oogo School in Kenya, will be visiting nine Lambeth schools this summer as part of a fantastic cultural exchange project. This will be an incredible opportunity for London pupils to learn about life and culture in Kenya and will help to build partnerships for the future. As part of this project on 20th May 2017 Art4Space will be hosting an art auction at their community art centre in Stockwell. We are taking part in Local Giving's Local Hero challenge. From 1 April to 30 April we are asking for donations which will go towards our international cultural exchange project happening this Summer. For this challenge, our team will be mosaicing hearts for 24 hours from noon 25 April to noon 26th April at our Community Art Centre in Stockwell. You are welcome to visit our studio during those 24 hours. 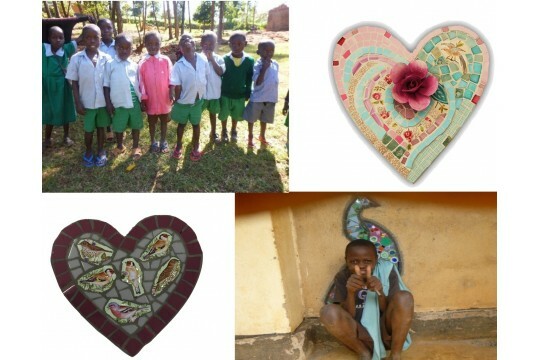 The hearts we create will then be auctioned at our spring event on 20th May. The money raised for our mosaic marathon will help to train Peter in London which will further impact his work in Kenya, and provide a unique platform for the pupils to learn and understand about different cultures across the world. All donations, no matter how small, will make a huge difference to our project!